Though most of the songs on her new album were written in a fraction of a day, it's taken Karry Walker years to pull them together. Breakup, relocation, death, reunion and marriage passed since the songs' inceptions, beginning in 2003. "It's only been in the last year that I finally picked this stuff up again," says Walker from the Petaluma home where she and her husband live. 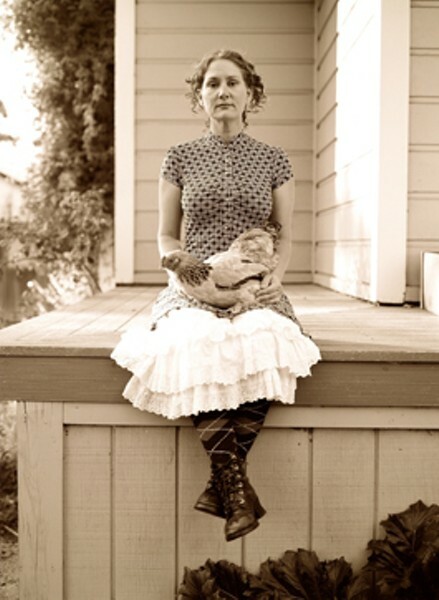 Walker was once the great trip-hop hope of Sonoma County, and her 1999 debut, Lipsbury Pinfold, met with critical success. But in the years since, Walker went underground and began recording songs that were less about telling a story and more about painting a sound-picture. Her new album, Foamy Lather, has a kitchen-sink eclecticism that's equally creepy and playful. "A lot happened in the last years," Walker says of the period shortly after she separated with her then boyfriend (and now husband). "I went through a whole furious phase of writing." She moved from Sonoma County to Oakland; meanwhile, her mother became very ill from cancer, and the music stopped. "There was about a year where I was living in Oakland, working in San Francisco and driving to my hometown, Turlock, twice a month to take care of my mother. During that time, music just dropped out of my life. I couldn't even listen to the radio." But Walker wanted the recordings to see the light of day. "I wanted to get this record done for my mom, even though she would never understand it, ever. She was the original Ultralash." Walker uses the word "ultralash" to describe a time in a girl's life right before her uninhibited Supergirl powers become fettered with self-awareness; it's a moniker she sometimes claims as a stage name as well. "[My mother] was able to maintain that spirit," she says, "without getting caught up in what people thought about her." Walker began recording as Ultralash in 2002, when she released her second album. It signaled a new direction, with Walker stepping fully into the role of writer-producer, paring her songs down and then building them back up with out-there elements like obscure vintage instruments and found sounds. Concurrently, Walker became involved in the Immersion Composition Society (ICS), which Michael Mellender and Nicholas Dobson formed in 2001. In the ICS, members select one day and agree to independently write, record and mix as many songs as possible—the goal being 20—and then gather together in the evening for a listening party, where they celebrate and discuss each other's output. "I go to the listening party that night, and a lot of times I don't even remember the stuff I'd recorded," Walker admits. "Which is a great sensation. You wake up really early that day, and you start recording whatever comes out. And then you put it away, and you start writing something new." On Foamy Lather, all but one of the 14 tracks are from her ICS sessions, which gives the songs a palpable immediacy. Some are much more fleshed-out than others, but the fleeting fragments, such as the titular title track, color the album with a coy playfulness that let the texture of her music speak for itself. "I've been much more interested in the production, putting sounds together and getting wrapped up in that, because I just think it's a blast," Walker says. "I just had this guy in Portland build me an Omnichord, which is a really cheesy autoharp put out by Suzuki. I bought one of these things and sent it to him, and he did a circuit bend on it and now it sounds freakazoid. I call it my Ouija board. You plug it in and there's feedback you get out of it, but underneath you hear these little harp tones." Walker says that in order to focus on promoting Foamy Lather, she hasn't been recording much, but she did recently participate in an ICS exercise where members drew made-up character names out of a hat, with the assignment to compose a theme for that character for a mythical musical opera. "So we did that, and my scrap was just called, in capital letters, 'THE BAD THING.' It wasn't the villain—it was a bad thing that might happen. And the name that was drawn was 'Meat Foam.' And I was so tickled because I got that." Karry Walker's North Bay CD release party will be announced soon. For music and more info, visit [ http://www.ultralash.com/ ]www.ultralash.com.